These peaches came from two different trees The first two (left to right) were from one tree and the third one (far right) was from another tree. The first two peaches on the left are smaller and have small dark sunken spots, surrounded by yellow areas (see bottom picture for closeup). Both peach trees are the “Sweet Sue” variety and “Sweet Sue” is susceptible to bacterial infections. These spot were caused by a bacterial pathogen. The spots first appear as a round yellow areas that turn brown and collapse in the middle. As the disease progresses, the sunken areas merge. 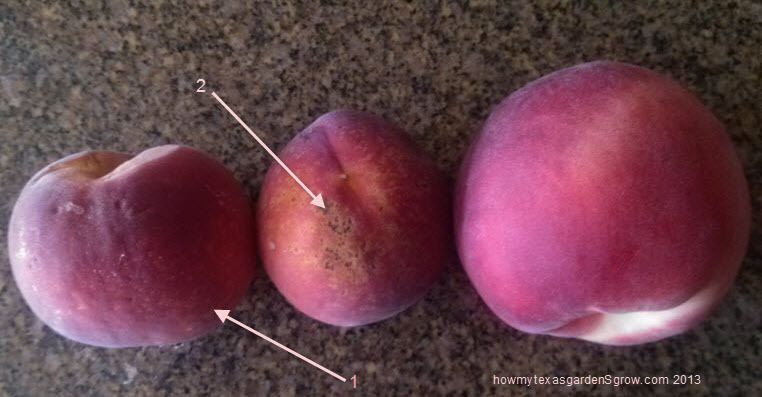 ?This peach (left) has minimal damage at this point so it can be washed –or the spotted area can be cut out–and the peach can be eaten. Crops that are organically grown (without chemicals) often have spots and blemishes (look next time you are in the produce section at a grocery store). How do I prevent this damage from happening?